This has to be one of my favorite weddings details images and judging by the reactions of both my clients and my colleagues, this one will become a standard. All of my brides are asking me to recreate this picture on their wedding day and a lot of my colleagues have told me that they are taking this photograph on their wedding assignments now. The simplicity of this wedding picture is what gives it so much charm. The brides shoes are placed against each other and the soles and heels form a heart. In this particular shot I set the shoes up on the face of the grand piano in the bride’s living room in Brooklyn, NY. 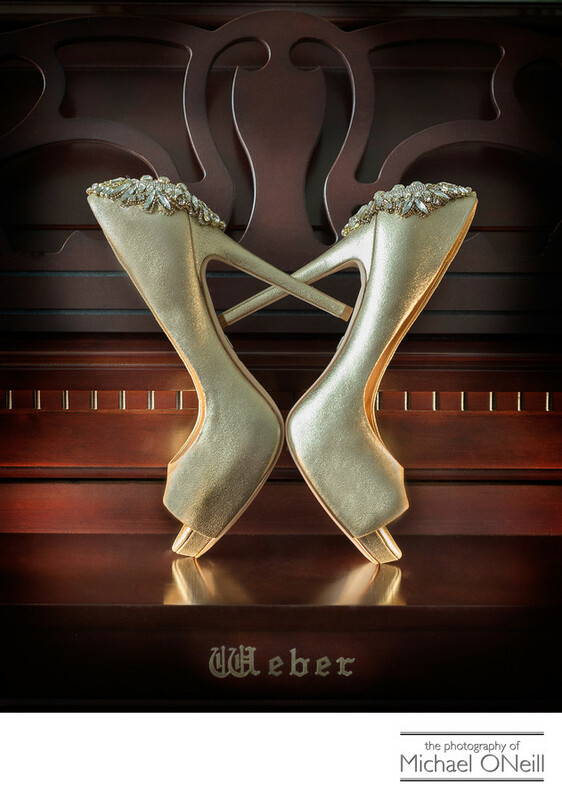 The rich tone of the wood perfectly complimented the gold tone of her bejeweled wedding shoes. I arrive early at all of my wedding assignments to take lots of details shots while the bride and her bridesmaids are having their hair and make up done for the big day ahead. I’ll take pictures of the wedding rings, the flowers (including the bride’s bouquet and those of her bridal attendants). I create photographs with the wedding invitation, wedding rings, garter, gifts for the bridal attendants, gifts and flowers from the groom and lots of other unique items that are important to the bride.